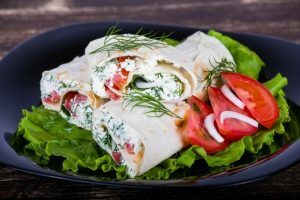 The tortillas combined with juicy filling are the best breakfast, lunch or dinner which you can prepare. You can use them even like appetizers, with any drink. Because wraps are easy to make, even the beginners can make them. 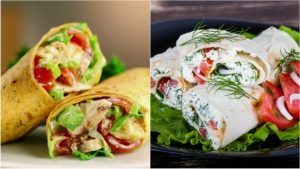 Tortillas are readily available and cheap, we offer 5 recipes that you can make the next time if you what know what to prepare quickly. Combine 180 g cream cheese, ricotta or another soft cheese with 50 g cream. Make a creamy mixture and add the garlic powder and dill. Put that over the tortilla and place the tomato on the cream. You can put onions if want. Fry a steak chopped in small pieces and then add vegetables by your choice. Put cream on the tortilla, put the chicken and vegetables, salt, seasoning, and put a little balsamic vinegar. Chop the 100 g avocado, tomatoes, green peppers and onion. 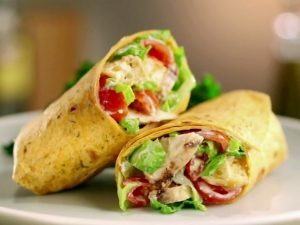 On the tortilla place lettuce leaf, put cream cheese, and then put the vegetables. Chop 50 – 80 g black olives, chop onion and then open one tuna. 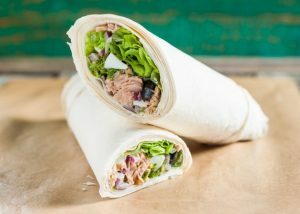 Put on the tortilla a leaf from lettuce and then the tuna and add the onions and olives on it. 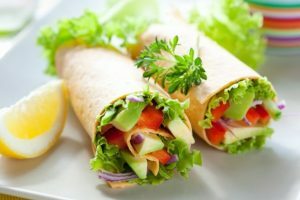 Wrap and serve with a little lemon juice at the end. Fry a piece of steak into small pieces. Prepare the caesar sauce with 100ml of thick yogurt, a little grated garlic, 1/2 teaspoon mustard and 1-2 teaspoons of lemon juice. Add salt to taste. 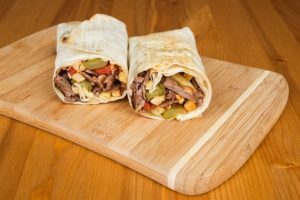 Put on the tortilla thin slices of cucumber and lettuce add parmesan then the meat, and at the end put the sauce. Next articleWhy women born in the sign of Cancer are absolutely irresistible?